Reflection of Mount Nanda Ghunti over the crystal clear water of Bedini Kund! In previous photo stories I had brought before you some of the breathtaking snow clad mountain peaks of the Garhwal Himalayas as seen in Roopkund trek, and introduced you with Bedini Bugyal, the dreamscape alpine meadow of Uttarakhand. Today, it is "Bedini Kund", a small high altitude pristine Himalayan lake, undoubtedly the lesser sung jewel on the Roopkund trekking trail! 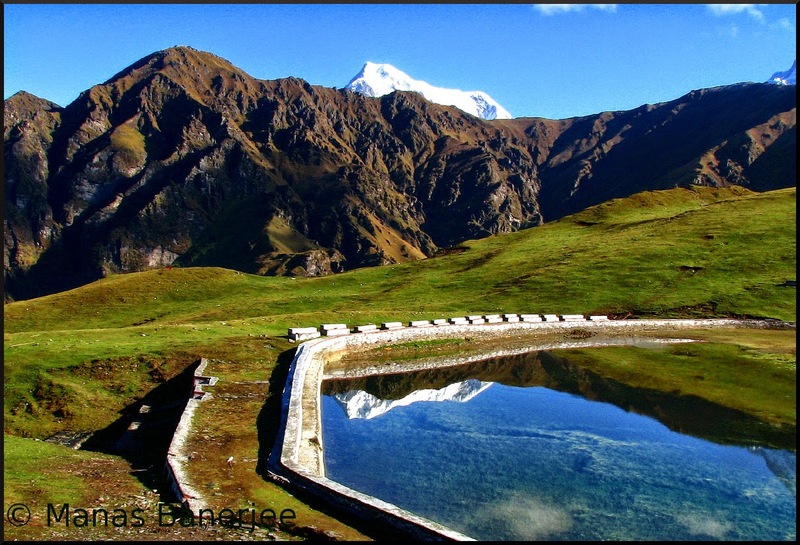 Bedini Kund, also referred to as 'Vaitarani' lies somewhere at the middle of this largest grassland of Asia and lures all Roopkund trekkers with vivid reflections of white topped Mount Trisul and Nanda ghunti on its crystal clear shallow water. Fleecy white clouds add extra magic to the already magical vista comprising the Bedini Kund! In the photograph below this para you can see two tiny stone structures inside the enclosure of Bedini Kund. These are sacred Hindu temples worshiped by local people who believe that four Vedas were scripted right at that holy spot where this mini lake stands today. A traveler or a photographer would have no much business with legends and their authenticity, but the magical shades of blue and green in the entire landscape of Bedini Kund are visually delicious enough to consider Roopkund as your next trekking destination. Stone temples by the lake boost its religious as well as the archaic quotient. What a lovely landscape! Superb clicks! Hope to visit here soon! These pictures are fabulous. I can picture myself going there, being rooted at one spot and forgetting all about the trek ahead! Now I will have to trek to this place. Sigh. Wow, it looks gorgeous! I didn't even know of this one. Thanks a lot for sharing. Now I'm definitely keen on trekking to this place if I get the chance, some time.